After re-locating to the United States, during the 1960s and ’70s Morath worked closer to home, raising a family with Miller and working with him on several projects. Their first collaboration was the book In Russia (1969), which, together with Chinese Encounters (1979), described their travels and meetings in the Soviet Union and the People’s Republic of China. In the Country, published in 1977, was an intimate look at their immediate surroundings. For both Miller, who had lived much of his life in New York City, and Morath, who had come to the US from Europe, the Connecticut countryside offered a fresh encounter with America. Reflecting on the importance of Morath’s linguistic gifts to their shared projects, Arthur Miller wrote that “travel with her was a privilege because [alone] I would never been able to penetrate that way.” In many respects, Morath’s photographs and Miller’s texts offer two sides of the same coin. In their travels Morath translated for Miller, while his literary work provided innumerable opportunities for Morath to encounter an international artistic elite. At home and wherever she traveled, Morath sought out, befriended, and photographed artists and writers. During the ’50s she had photographed artists for Robert Delpire’s magazine “L’Oeil,” including Jean Arp and Alberto Giacometti. She met the artist Saul Steinberg in 1958. When she went to his home to make a portrait, Steinberg came to the door wearing a mask that he had fashioned from a paper bag. Over a period of several years they collaborated on a series of portraits, inviting individuals and groups of people to pose for Morath wearing Steinberg’s masks. Another long-term project was Morath’s documentation of many of the most important productions of Arthur Miller’s plays. As the scope of her projects grew, Morath prepared extensively by studying the language, art, and literature of a country in order to encounter its culture fully. Although photography was the primary means through which Morath found expression, it was but one of many tools in a kit to which she continued to add throughout her lifetime. In addition to the many languages in which she was fluent, Morath was also a prolific diary and letter-writer; her dual gift for words and pictures that made her unusual among her colleagues. Morath wrote extensively, and often amusingly, about her photographic subjects. Although she rarely published these texts during her lifetime, Morath’s posthumous publications have focused upon this aspect of her work, bringing her photographs together with journal writings, caption notes, and other archival materials relating to her various projects. During the 1980s and ’90s, Morath continued to pursue both assignments and independent projects. The film Copyright by Inge Morath was made by German filmmaker Sabine Eckhard in 1992, and was one of several films selected for a presentation of Magnum Films at the Berlin Film Festival in 2007. 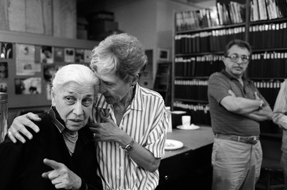 Eckhard filmed Morath at home and in her studio in Connecticut, and in New York and Paris with her colleagues, including Cartier-Bresson, Elliott Erwitt and others. In 2002, working with film director Regina Strassegger, Morath fulfilled a long-held wish to revisit the lands of her ancestors, along the borderlands of Styria and Slovenia. This mountainous region, once part of the Austro-Hungarian Empire, had become the fault-line between two conflicting ideologies after World War II and until 1991, when attempts at rapprochement lead to conflict on both sides of the border. The book Last Journey (2002), and Strasseger’s film Grenz Räume (Border Space, 2002), document Morath’s visits to her homeland during the final years of her life.